Yes, I've noticed the series 2 dvd doesn't have subtitles either. I imagine it annoying if someone is deaf. or has a napping daughter! The funny thing is, these DVDs are apparently essentially the same as the US Shout DVDs (in terms of episode content and timings), which did have subs, so it shouldn't have been much effort to include them. I got my legacy red ranger sword yesterday, it's fookin massive. Smyths didn't put any packing material in, so it got a fold in the centre of the box. Mine arrived with some dings to the corner. I'm not too bothered. Its so awesome though. Much bigger than I anticipated. The original version only reaches the hilt in size. Oh lord. I paid for 1 day shipping on Thursday and ordered at like 1, it dispatched by 3 but still didn't make it yesterday and if the box is in anyway damaged I'm gonna have to take it back and get a new one. I can't have my £150 product getting damaged, no chance. Hey, we're ahead of the US again. The Lion Fire Fortress Zord is now available. He's a big boy with a big price. Photo from Andrew Warke-Coll on Facebook. On a legacy note, Forbidden Planet in London had all 5 of the Metallic MMPR figures, and Blue, Black, Pink from In Space. From display had the communicator, coin set, Ninja Megazord and B&G Dragonzord. After watching the power ranger film over the weekend, I finally ordered a morpher. Smyths toys, the movie morpher is £14.99. That's cheaper than tescos. Last edited by Red Rock; July 31st, 2017 at 02:31 PM. A random little freebie - If you're with O2, you can get a free black Red Ranger Ninja Power Star from Smyths. As of this post, there are 4 days left on the offer. 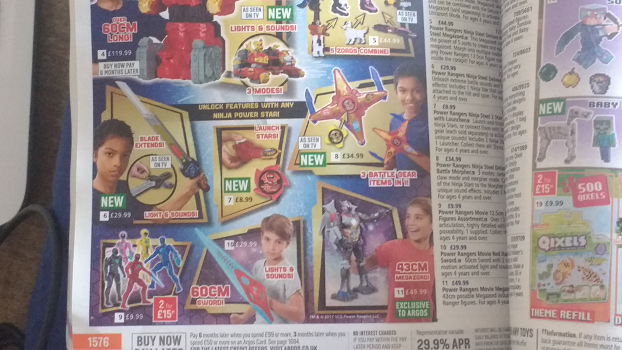 Collect your free Power Rangers Ninja Steel Ninja Star from Smyths Toys Superstores. To celebrate the awesome new Power Rangers Ninja Steel TV series and toy range, you can get your hands on an exclusive black Ninja Star for your little one. Your Ninja Star can “Charge Up” other Power Rangers toys (sold separately) to activate cool features like lights and sounds. Within the range there are over 50 Ninja Stars to collect, so why not start your collection with this exclusive freebie. To get your hands on one, simply head down to your local Smyths Toys Superstore and show in store staff the promotional code. Whilst you’re there, check out the full range of Power Rangers Ninja Steel action figures, Zords and role play toys. The all-new show premieres on September 4th on POP, so make sure you tune in. Ive bought the Lion Fortress as one of my sons main Christmas presents. Had a quick peek in the box (to ensure its all there) thing looks quite impressive. Whats it actually look like fully assembled? Ninja Sale! 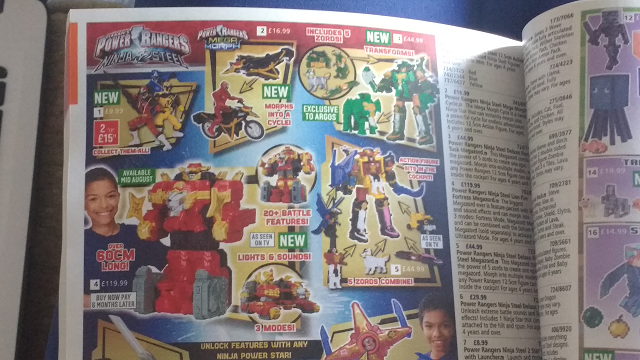 At the Entertainer, 20% off all ninja steel stuff, so £96 for Lion Fire. But I am (forgive my words. I am having trouble thinking precise word to express my meanings for understanding for others). That ninja steel megastore was £42.99 now reduced to £34.39. The megastores used to cost around £35 each at full price anyway. Seeing that sale reducing the price from £42.99 to £34.99 to me seems like an artificial discount. To some unknowing person see '20% off' might think it's good. But to me something feels ... Ah! I don't know the correct word. I hope people can understand my writing. 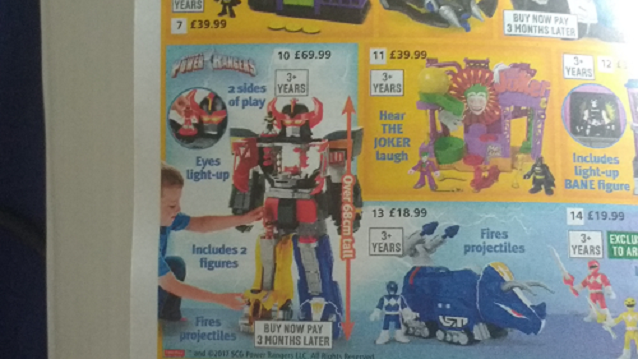 Saddly the RRP for the Megazords this year appears to be the £42.99, its not a case of the entertainer jacking the price just to mark it as 'on sale' a few weeks later. I've noticed a trend (starting with LEGO) of toy companies increasing prices this year. Im rather surprised the 5" NS figures remained at 9.99, I really was expecting them to be around 10.99 (as Hasbro have done with their Marvel figures - which have far less detailing & articulation). American RRP is still the same as last year, so it's not Bandai. But, as dwphoenix said, £43 is the UK RRP for all megazords across the board, every retailer (except A1 who strangely sell at £31), so it's not just Entertainer profiteering with fake sales. My guess? Brexit and other GBP instability issues. Ah, 2017. I won't miss you. EVERYTHING'S going up in price- not just the toys. Food, currency, services. Hold on to yo butts. Also clear your credit card debts as soon as possible. I'm genuinely scared now after the prices they announced for Zeoniser, helmets, gold staff etc... no way I can afford all that in such a tight time. Space it out. Please.